The Terma Simple adds a luxury accent to bathrooms, en-suites, and washrooms - providing an independent heat source and warm towels on demand. Featuring a push-button interface, this 600w bathroom radiator can be controlled with a few simple presses for quick and convenient temperature management. Download the Terma Simple assembly diagram, Terma radiator manual, and One heating element manual here. Terma Simple radiators are rated IPX5 and can be installed in a suitable bathroom location by a professional electrician. For further installation information, please see the Terma Simple mounting guide and product dimensions. Radiators and towel rails for bathrooms, cloakrooms and wet rooms must be professionally installed by a qualified electrician and are not sold as a DIY product. Always defer to the manufacturer’s guidelines about the bathroom suitability of any product. All Terma Simple towel rails come with an 8 Year Manufacturer’s Warranty on the heater body and a separate 2 Year Manufacturer’s Warranty on the electronic heating element. Terma Simple Designer Electric Towel Rails are available with free next working day delivery. Next working day delivery is available when you order before 12pm (excluding weekends). Orders of multiple items may be shipped on a pallet. If you are ordering multiple different items, we will always endeavour to dispatch your goods together. However, separate dispatches may be necessary if the items you have ordered are being shipped from different locations. Check our delivery page or speak to our customer service team for more information. Please be aware that delivery times and charges may be increased if you want the items delivered to addresses in the Scottish Highlands & Islands, or outside the UK mainland. This will be calculated when you enter your postcode at the checkout. The Terma Simple provides elegant bathroom heating with convenient, basic control. 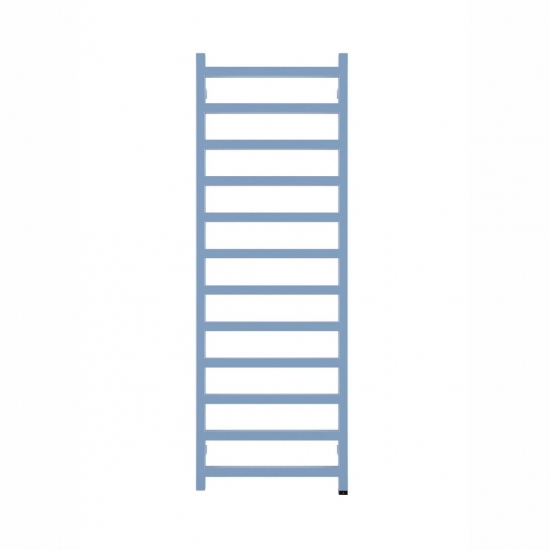 Its minimalist, geometric ladder design will look a treat in any modern bathroom looking for a clean and crisp aesthetic. The Simple 600w is able to heat areas up to 6m² and has a 12 rung design for convenient towel storage. Terma Simple Designer Electric Towel Rails are oil-filled and come fitted with an electrical element that includes basic in-built control features. Using its discreet ‘Heater One’ element, you can select between 45 °C and 60 °C temperature settings, as well as a 2-hour timer mode to restrict your energy usage. An anti-frost mode is also included, which will activate when ambient temperatures fall below 6 °C to prevent pipes from freezing. The Terma Simple has an IPX5 protection rating, making it suitable for installation in bathrooms, provided it is hardwired by a professional electrician.